By the time of the New Time, the main genres of painting were fully formed: a portrait in several varieties, still life, paintings on everyday and historical themes, animal studies. As for marinistics, for a long time she remained not that she was a stepdaughter, but a beggar against the already established genre art palette. A new life in her breathed our compatriot – IK Aivazovsky. However, he did not have schools and pupils. As IA Krylov in the genre of the fable – if not only, the best, and Aivazovsky – is exceptional among the “singers of the sea”. It is curious that in the aesthetics of romanticism the sea is a symbol of freedom, but the sea wave is a symbol of variability and impermanence. Drawing Aivazovsky easily, was incredibly productive and often exhibited – more than any of his contemporaries. The picture “Bay in Odessa, the Black Sea” for his style is typical. The presence of people is minimal and is indicated only by the boat and the rowers seated in it, as well as by several sailboats – near and a bit further away. In the distance, the outlines of the Odessa lighthouse and some other structures are also guessed. Of course, the main semantic load is the image of the sky – a terrible, clouded, but illuminated by the sunset. 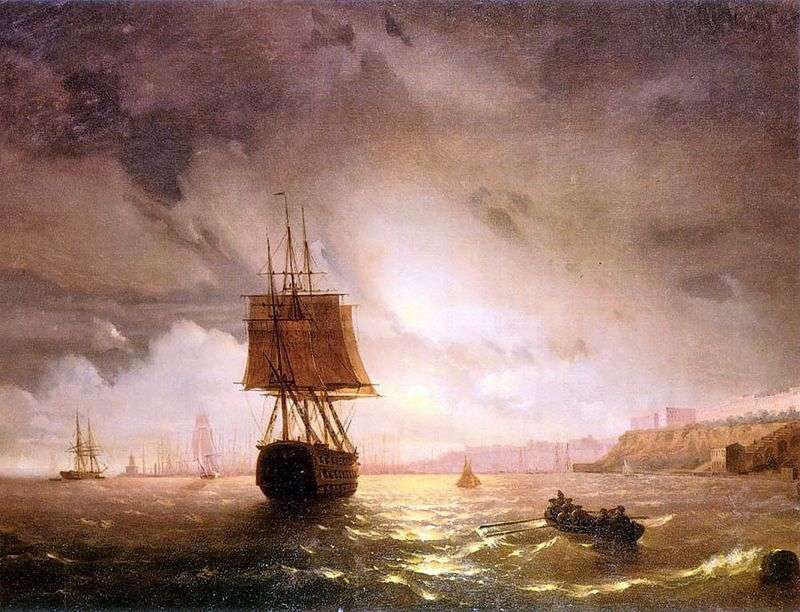 Description and meaning of the painting Bay in Odessa, the Black Sea by Ivan Aivazovsky.